The work of Bin Chen, left, and David Feldheim, assistant professors of molecular, cell, and developmental biology, represents important steps in the exploration of whether cell replacement could be an effective treatment for Amyotrophic lateral sclerosis (ALS). UC Santa Cruz has received $1 million from the California Institute for Regenerative Medicine (CIRM) to fund human embryonic stem cell research. 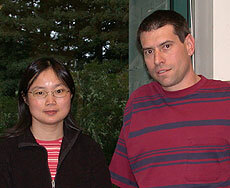 Two $500,000 grants will support the research of David Feldheim and Bin Chen, both assistant professors of molecular, cell, and developmental biology. The UCSC awards are part of the first state-approved research grants focused solely on human embryonic stem cells. The CIRM will distribute grants totaling approximately $45 million over two years to researchers at 20 academic and nonprofit research centers throughout the state. The recipients were selected from among 231 applications for more than $138 million, received from 36 California institutions. Because of their ability to generate many different cell types, human embryonic stem cells may potentially serve as a renewable source of cells for replacing the damaged cells in diseases such as Amyotrophic lateral sclerosis (ALS)--a rapidly progressive, fatal neurological disease that leads to the degeneration of motor neurons in the brain and spinal cord. Chen's research on molecular signaling and Feldheim's work on differentiation of these stem cells into motor neurons represent important steps in the exploration of whether cell replacement could be an effect treatment for ALS. Bruce Margon, vice chancellor of research, noted that UCSC received significantly large awards from the CIRM for the stem cell research--particularly considering the fact that the campus does not have a medical school or the extensive health sciences research efforts now in progress at many other UC campuses. He said that UCSC does have strong programs in several areas of biomedical research, and the CIRM grants will allow the campus to expand in an exciting new direction. Margon added that the research conducted at UCSC is critical to making a difference in the fight against chronic, debilitating neurological disease. "It makes me proud that the work here involves a direct attack on human suffering," said Margon. "ALS, for example, is an absolutely dreadful disease with no cure. The idea that right here on campus we are now pushing towards the solution is something that should make all in our community enormously proud." Although voters originally approved a $3 billion program to fund stem cell research in California in 2004, lawsuits have until now delayed funding for this first research project of its kind in the nation. Shortly after the CIRM issued these first grants, a state appeals court upheld the program. The agency is slated to approve approximately 25 additional grants totaling $80 million sometime next month. "We were amazed by the large number of applications that we received," said Robert N. Klein, chair of the governing board of the CIRM. "Because of their high quality, it was important to increase the number of awards and the amount of money granted. These projects will truly jump-start stem cell research in California."